Editor’s Note: This post originally published in June 2012 and has been updated for accuracy and comprehensiveness. The importance of monitoring keyword search rankings is only growing, so more and more people are asking the inevitable question: How do I do it? Because so many people want to monitor keyword search rankings, there are many different tools that have surfaced over the past few years. Although it’s great to have choices, this can be overwhelming for those new to keyword search rankings. Are free tools as great as paid? Are results 100% accurate? Are some tools easier to use than others? Finding the answers to these questions isn’t too difficult once you really understand what it means to monitor keyword search rankings. For those who are unfamiliar, a keyword ranking tool will help you understand where you are ranking on a SERP for a specific keyword. This will help you see whether or not you are optimizing your pages correctly, how well your competition is ranking for that keyword, and how your rankings change over time. Although ranking well on a SERP doesn’t necessarily mean conversion or success for your website, your website will improve its visibility and likely generate more clicks. Search Engine Watch reports that according to a study from Optify, 58.4 percent of all clicks from users hold the top three organic positions on a SERP. In other words, monitoring your position and changing your strategy to make sure you end up on page one is crucial. 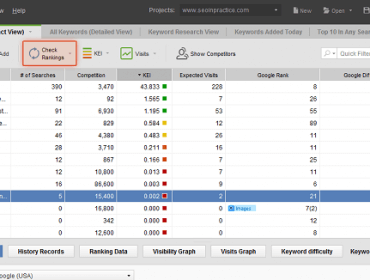 There are both paid and free tools that can help you monitor your keywords’ position. Depending on how granular you want to go, sometimes the free tools work just as well as the paid tools. Although they may not have quite as many features, they are typically easy to use and can get you the information you need. 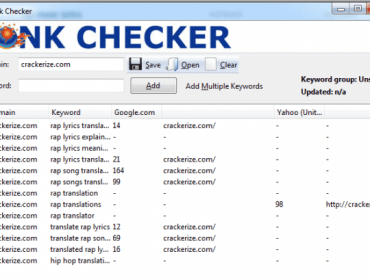 Rank Checker by SEOBook – This tool comes from SEOBook and is one of the most popular free tools for keyword monitoring. This is a Firefox extension (and only Firefox) allows you to see your rankings for Yahoo and Bing as well as Google. You can add up to 100 keywords and export them easily in order to really analyze the results. 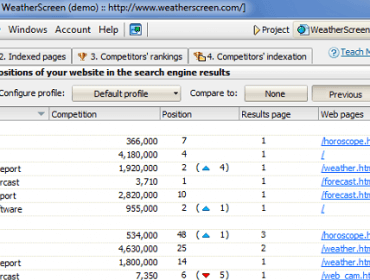 Web CEO – This tool allows you to compare your results and your competitors results side by side. It makes it easy to see your history of rankings and how they have changed over time once you setup the tool. 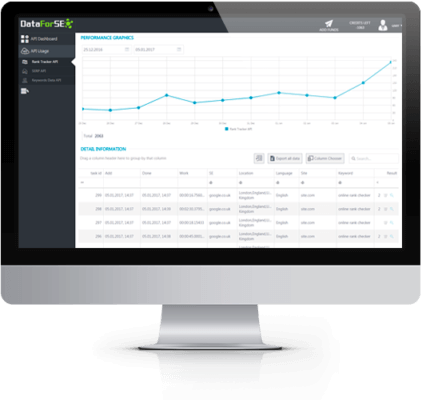 Get Stat – With Get Stat, you can access unlimited daily rank tracking. According to their site, you can track as many keywords as you want–every day. And, you only pay for what you need. As a result, you can stay on top of Google’s algorithm changes instead of playing endless defense. What’s more is you can also track images, plus search volumes, CPC, news, and maps. There is no additional cost if you want to track through both Google and Bing. In addition, you get the option of custom tagging so that you can view your keywords in a way that makes the most sense to you. There is even an option for smart, dynamic tags. The insights you receive from massive rank tracking is a lot different from smaller tracking analytics. Even if you only want to track 200 search terms, that number could easily explode when you consider different markets, devices, and locations. For instance, with their new SERP features tab, you can get insights on every aspect of your tracking results. Furthermore, there is new data daily. SERPS – With this tool, you can track thousands of keywords every day regardless of device, language, search engine, and location. You’ll also get results up to the 250th position. If you’re trying to boost your local presence, you can get rankings at the zip-code or city level. It works for both Google and Yahoo rankings with more than 400 country and language combinations. And, you get unlimited domains and users. 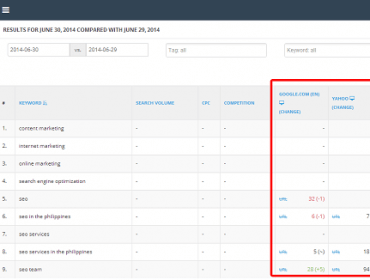 With daily data, you can see when there are any major changes to your rankings. SERPS also has a keyword research database of over 1 billion terms. Not to mention, you can organize your keyword with their keyword tagging system. And, you can generate bulk reports for up to 250 keywords each. You’ll also notice the user-friendly and straightforward dashboards that make it easy to find what you need quickly. 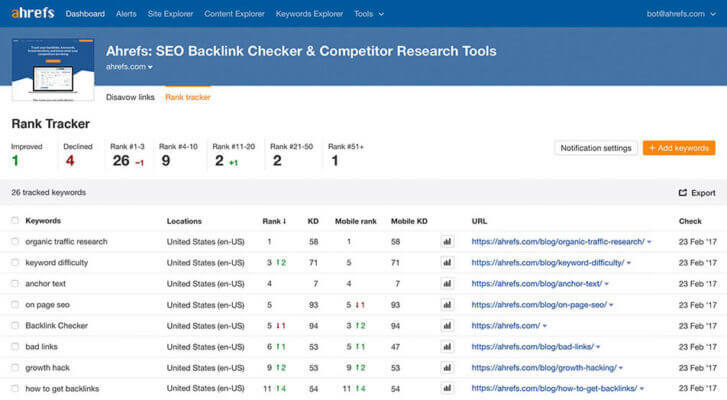 SEMrush – This application states it is the “all-in-one marketing toolkit.” When it comes to monitoring your search rankings, it looks at more than just on-page SEO. For instance, you get features such as position tracking, a technical SEO audit, competitive intelligence and even a backlink audit. SEMrush is also available for Enterprise clients with team-based projects and customized reporting. Many users like SEMrush because it has an option to execute competitor research. To illustrate, you can take a look at your competitor’s top keywords. You can also view the top 20 pages ranking for specified keywords. And, you can look at both organic and paid keywords. Furthermore, SEMrush will display a side-by-side comparison of up to five domains. You can see what keywords are similar, as well as how other domains rank for both paid and organic searches. Not to mention, SEMrush has a keyword difficulty tool that shows how difficult it would be for your website to rank for that keyword. Moreover, you can see which products are selling the best for your competitors. With these types of insights, your site can become profitable rather quickly. Moz Pro – Many companies invest heavily in powerful SEO tools, that make it difficult for the novice to compete. Sure, you can implement SEO without spending any money – but, there is a question whether the payoff is worth the time. This is where Moz Pro can come in to alleviate any doubt and automate tasks that would normally take hours to complete. 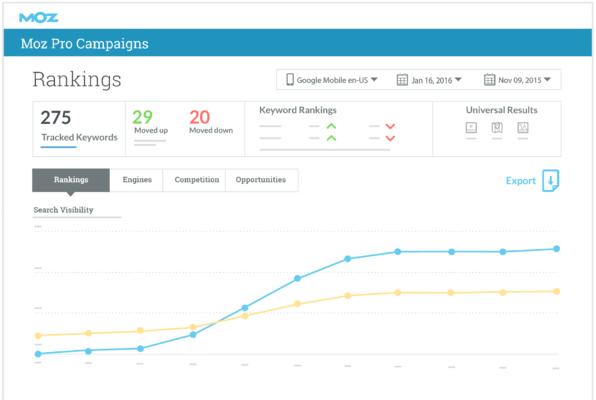 Moz Pro makes SEO simple by helping you to understand your visitors. With the Moz Pro keyword explorer, you get an overview of keyword research metrics to help you make better decisions overall. You can also track both your rankings and the rankings of your competitors. As a result, you have an insider’s view of how your site ranks for keywords relative to that of your competition. Under one hub, you get keyword research, link-building opportunities, competitor comparisons, on-page grader, crawl test, and mention alerts. Imagine trying to perform all those tasks manually. And, Moz Pro offers a 30-day free trial to get you started. Ahrefs – When it comes to SEO, you must take it further than just building links and incorporating a few keywords. Ahrefs Rank Tracker offers the ability to check your rankings from any location and device. Not only does it check for backlinks, but you are also privy to competitor research. You can also search for both your desktop and mobile rankings, side by side. Ahrefs also plots your keywords so that you get a complete history of every position. If you’re busy, Ahrefs sends email reports to keep you up to date, you don’t even have to open the interface. With dozens of features, Ahrefs is one of the most popular SEO research tools available. Some of the options include Mentions Tracker, Domain Comparison, SEO Reports, Backlink Checker, and Site Explorer. In fact, Ahrefs crawls 6 billion web pages every day. And, you will get notifications of web mentions, new or lost backlinks, and updated keyword rankings. SE Ranking – This is a cloud-based SEO application that will improve your SEO efforts immediately. If you have any doubts, SE Ranking does offer a free trial. SE Ranking offers 100% accurate keyword ranking checkers from Bing, YouTube, Google, and Yahoo. As you can see, there are a wide variety of sites and search engines where you can receive keyword rankings. You can also track rankings in all locations, and all any device. If you need to verify the data, SE Ranking will provide a cached copy. In addition to rankings, you can track search volume, relative traffic, paid rankings, and SERP features. Furthermore, you can track up to five of your top competitors. Moreover, SE Ranking has a flexible pricing model that starts at $4.20/month. SerpBook – Like SE Ranking, SerpBook offers tracking capabilities from Yahoo, Bing, Google, and YouTube–along with one more: Google Maps. If you would like to give it a test run, SerpBook offers a 14-day free trial too. In a matter of minutes, you can convert the data into sharable reports. You can also customize your reports by adding your logo and export them in PDF or CSV format. It also only takes minutes to configure your keywords. You can track from anywhere, and track globally or locally. If any of your keywords enters/leaves the 1/10/100 position, you’ll get an instant alert. Not to mention, you can grant user access to anyone for specific categories. 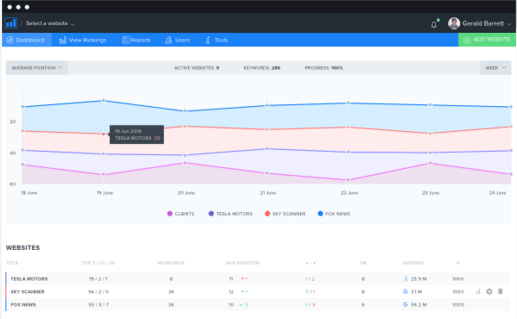 Agency Analytics – This platform is designed exclusively for agencies. Nonetheless, that should stop anyone from testing out its features–especially with plans that start at $49 per month. This platform is so powerful, it is already utilized by over 2,000 marketing agencies–that should give it enough in terms of credentials. 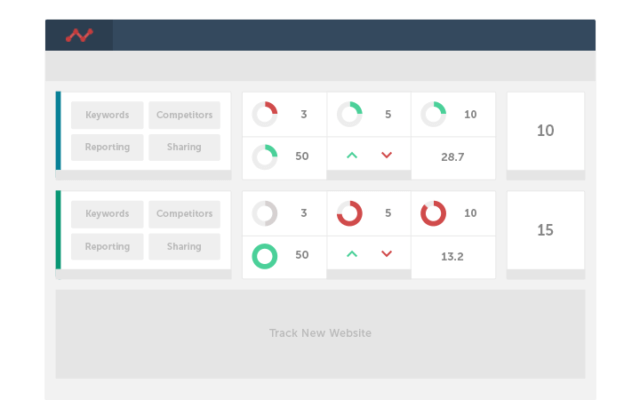 Features include automated reports, brandable reports, and a custom dashboard with drag-and-drop utility. You can also integrate the platform with over 30 sites include Google AdWords, Instagram, Facebook, Google Analytics, Bing ads, LinkedIn, Twitter, and YouTube. Agency Analytics also provides critical SEO tools such as a Rank Tracker, Backlink Monitor, Site Auditor, and Competition Analyzer. You just plug it in and forget it. 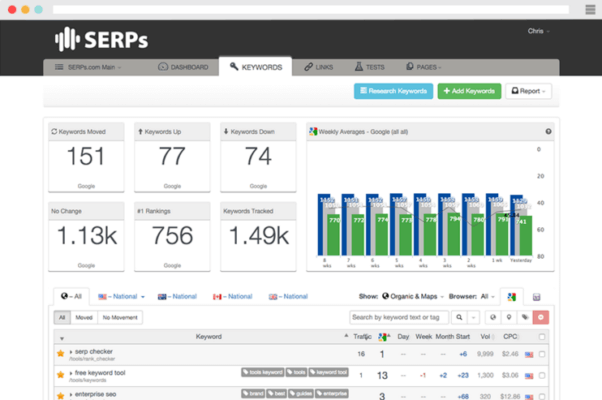 Rank Tracker – What makes Rank Tracker so great is the ability to track all your keywords instantly across all search engines and then have it automatically go into a clear, concise report. This tool also allows you to compare your rankings with competitors on just about every different search engine. 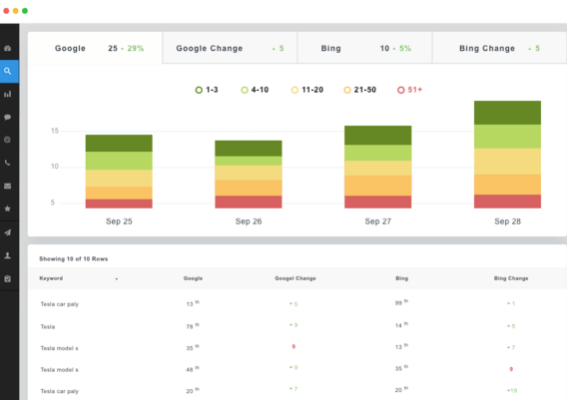 SEO Ranking Monitor – This tool also allows you to choose which search engine you want to track (including Google local versions) as well as upload keywords to track in bulk. You can compare your rankings with the rankings of your competitors, and the tool will even generate graphs for you to help make the numbers easier to read. For the basic package, it’s only $19 per month. RankTracker – This tool offers keyword ranking tracking throughout multiple search engines and web sites. RankTracker was first launched in 2012. Today, the platform boasts over 13,000 companies as clients. If you need to make quick changes, you can since RankTracker provides on-demand updates on your keyword positions. All you have to do is click the “refresh” button. As a result, you can easily determine how to outrank your competition. Plus, you can tailor your keywords to different languages and locations. RankTracker offers multilingual tracking. For example, you can use RankTracker to help create a language-specific SEO campaign. Still, it can also be used for local tracking to help grow your local presence. Data for SEO – This tool offers SEO data through API tailored for agencies and software companies. For instance, you can get SERP API, keywords finder API, keywords data API, and Competitor API. To go a bit further, their OnPage API displays detailed on-page data. All you need to do is to pull up a website domain; Data for SEO will start scanning right away. You can even view API usage in real time. Then, you can filter the results or even get data on bad meta tags and duplicate pages. In terms of cost, one scanned page is charged at .25 credits. Knowing where you fall when it comes to certain keywords will help you understand how your strategy needs to change (or remain the same). Although your position on a SERP doesn’t necessarily mean that you will gain any more clients or customers, it is the first step. Ranking well on a SERP gives your company the chance to show off what you know, and the rest is up to you.